Goodreads: "Later he told me that he’d been afraid to show me the painting. He thought I wouldn’t like the way he portrayed me: dragging myself across the field, fingers clutching dirt, my legs twisted behind. The arid moonscape of wheatgrass and timothy. That dilapidated house in the distance, looming up like a secret that won’t stay hidden." Kritters Thoughts: What a piece of work! From beginning to end, I loved how this story unfolded. Christina Olson tells her story of growing up in a small town in Maine and how her and her family did not quite move with the times and how apparent that is when an artist comes to stay for a few summers and Christina can then see her life and her home through his eyes. This book starts each section with a title and starts in the "present" time where Andrew Wyeth the artist is living in their home and spending summers making art. In the middle of this book while reading, I looked Andrew Wyeth and his artwork and read his Wikipedia page, it was interesting to see the truth behind this fictional story. Then naturally the book went back in time to Christina's story. Moving chronologically, it felt as though Christina was telling Andrew and the reader her story and how they got to where they are now. I loved how Christina told her story and I ached when she ached. I was completely invested in Christina and really wanted to know where she would end up and hoped that she found satisfaction in the life that was thrown her way. 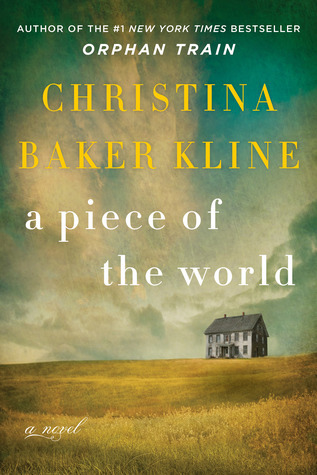 The way Christina Baker Kline weaves fact and fiction is just spot on. I love wondering what parts are true and where she stretched it a little. I will absolutely continue to read her take on historical tales. I'm not familiar with the art featured in this book but the story itself is fascinating!